The following success story is a classical illustration of scientific progress through concerted interplay of observation and theory. It concerns a 35-year old mystery which has now been solved by means of exciting observations of a strange double star. An added touch is the successive involvement of astronomers connected to the European Southern Observatory. For many years, astronomers have been puzzled by the fact that, among the thousands of very young, hot and heavy stars which have been observed in the Milky Way, there are some that move with exceptionally high velocities. In some cases, motions well above 100 km/sec, or ten times more than normal for such stars, have been measured. How is this possible? Which mechanism is responsible for the large amounts of energy needed to move such heavy bodies at such high speeds? Could it be that these stars are accelerated during the powerful explosion of a companion star as a supernova? Such a scenario was proposed in 1961 by Adriaan Blaauw , but until now, observational proof has been lacking. Now, however, strong supporting evidence for this mechanism has become available from observations obtained at the ESO La Silla observatory. 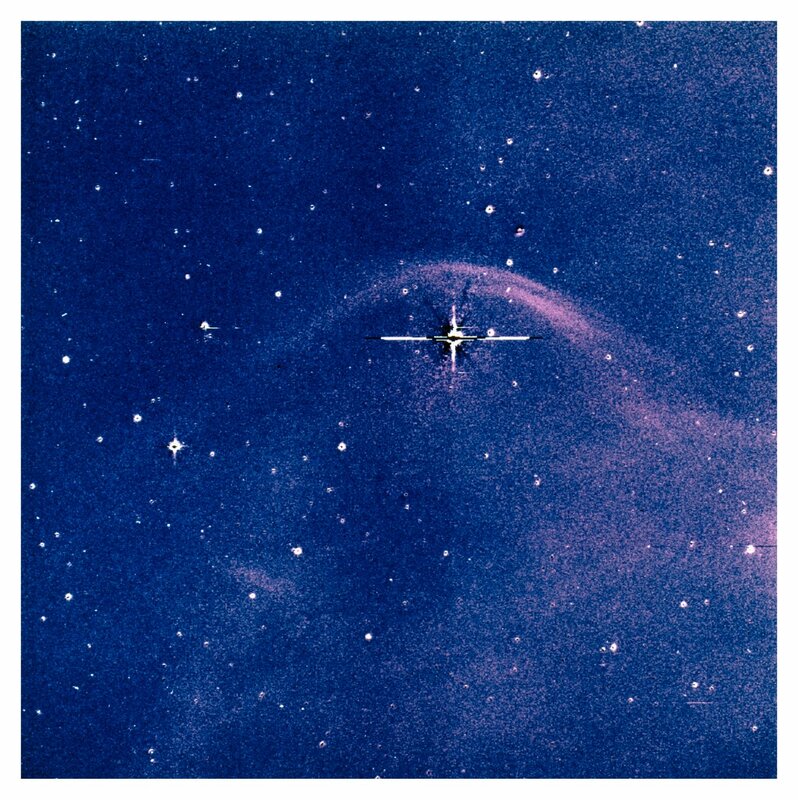 OB-runaway stars  are heavy stars that travel through interstellar space with an anomalously high velocity. They have been known for several decades, but it has always been a problem to explain their high velocities. 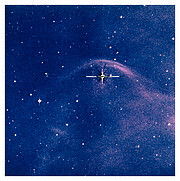 Although most OB-runaway stars are located at distances of several thousands of lightyears, their high velocity results in a measurable change in position on sky photos taken several years apart. The velocity component in the direction of the Earth can be measured very accurately from a spectrogram. From a combination of such observations, it is possible to measure the space velocity of OB-runaways. It has also been found that some OB-runaways display bow shocks of compressed matter, which look very much like the bow wave around a boat crossing the ocean. They are of the same physical nature as a bow shock created by a jet-fighter in the air. The explanation is similar: when an OB-runaway star plows through the interstellar medium (a very thin mixture of gas and dust particles) with supersonic velocity , interstellar matter is swept up in a bow shock. Stars of low velocity do not create bow shocks. Thus, the detection of a bow shock around a particular OB star indicates that it must have a supersonic velocity, thereby securely identifying it as a runaway star, even if its velocity has not been measured directly. When a star's direction of motion in space is known, it is possible to reconstruct its previous path and, even more interestingly, to find the place where the star originally came from. It turns out that the paths of many OB-runaways can be traced back to socalled OB-associations, that is groups of 10 to 100 OB-type stars which are located in the spiral arms of our galaxy. About fifty OB-associations are known in the Milky Way. In fact, the majority of all known OB stars are members of an OB-association. Therefore, it is not very surprising that OB-runaway stars should also originate from OB-associations. This is also how they got their name: at some moment, they apparently left the association in which they were formed. But why were the OB-runaway stars kicked out of the OB-association and how did they achieve such high speeds? One possibility is that some OB stars in an OB-association are ejected due to strong gravitational effects at the time of close encounters between the members of the group. Complicated computer simulations show that this is in principle possible. Nevertheless, since many years, most astronomers think that a more likely scenario is that of violent supernova explosions, first proposed in 1961 by Adriaan Blaauw. Stellar evolution theory predicts that all OB stars will end their life in a supernova explosion. The heavier the OB star, the shorter its life. For instance, an OB star with a mass of 25 times that of the Sun, will explode after only 10 million years, compared to an expected life-time of about 13,000 million years for the Sun (which is not an OB star and will not become a supernova). Blaauw suggested that when an OB star is bound to another OB star in a binary system (a 'double star'), the supernova explosion of one of the stars (the heaviest of the two would explode first) results in the rapid acceleration (in astronomical terminology, a 'kick') of the other one. The reason for this is as follows. When two heavy stars orbit each other at high velocity, they are held together by their mutual gravitational attraction. But after the supernova explosion, one of the stars has lost most of its mass and there is no force to hold back the remaining OB star. The OB-star therefore immediately leaves its orbit and continues in a straight line while preserving its high orbital velocity. The effect is the same as when cutting a swinging rope with a stone attached to the end. Soon thereafter, this star will escape from the OB-association and start its journey through interstellar space as a new OB-runaway. About half of the known OB stars are members of a binary system. Modern evolutionary scenarios for such systems were developed by Edward van den Heuvel . He realized that during the evolution of a close binary system, a phase of intensive mass transfer occurs, whereby matter flows from the heavier star towards its lighter companion. This has important consequences for the further evolution of the system. The mass transfer happens, after a few million years or even less, when the heaviest and therefore most rapidly evolving star increases in size and becomes a supergiant, many times larger than our Sun. The rate of mass transfer can become so large that this initially heaviest star eventually becomes lighter than its companion. This phase of mass transfer will not change the ultimate fate of the supergiant star and it will still be the first of the two to explode as a supernova. An important result of the mass transfer process is, however, that the central remnant of the supernova explosion, i.e. a neutron star or a black hole will remain gravitationally bound in an orbit around the companion OB star, also after it has received a high kick velocity. Thus, from what is known about the evolution of heavy stars in binary systems, an OB-runaway that is expelled from an OB-association by a supernova explosion should be accompanied by a compact star. However, many astronomers have in the past looked carefully for the presence of a neutron star or a black hole around the known OB-runaway stars, but none was ever found. That negative observational result obviously did not lend support to the supernova scenario. This was a long-standing enigma. Fortunately, it now appears that it has finally been solved. Based on new observations, a group of astronomers , headed by Lex Kaper of ESO, has found that a well-known binary system of an OB-star and a compact neutron star possesses all the charateristics of a bona-fide runaway star. Vela X-1 is the brightest X-ray source in the Vela constellation. It consists of a so-called X-ray pulsar  which is definitely a neutron star produced by a supernova explosion and an OB star as companion. An image (ESO Press Photo eso9702) of the surroundings of the comparatively bright OB star HD77581 and its (optically invisible) companion Vela X-1 was obtained with the 1.54-m Danish telescope at La Silla, through a narrow-band H-alpha filter. It clearly shows the presence of a typical bow shock, thus immediately confirming the runaway status of this system. In fact, this is one of the most 'perfect' bow shocks of parabolic form ever observed around an OB-runaway. Moreover, the orientation of the bow shock indicates that the system is moving towards the north; its origin must therefore lie somewhere south of its present position in the sky. It also turns out that the accordingly deduced path of HD77581 crosses a well-known OB-association with the designation Vel OB1 . At the measured distance of Vel OB1 of about 6000 lightyears, the observed proper motion and radial velocity of HD77581 indicate a space velocity of 90 km/sec. With this velocity, it would have taken HD77581 and its compact companion about 2.5 million years to travel the distance between Vel OB1 and its present position. This corresponds exactly to the expected time that has passed since the supernova explosion of the progenitor star of Vela~X-1, as deduced from the observed properties of the binary system. The observation of a bow shock around the OB star HD77581 and its compact companion Vela X-1 supports the scenario originally proposed by Blaauw to create OB-runaway stars by the supernova explosion of the binary companion. Following back the path of the system resulted in the discovery of the place where it was born and from where it escaped after the violent supernova explosion which produced the neutron star that now manifests itself as the strong X-ray source known as Vela X-1. Professor Adriaan Blaauw is a well-known Dutch astronomer (Leiden and Groningen). He participated very actively in the build-up of ESO in the 1950's and 60's and he was ESO Director General from 1970 - 1974. He is the author of ` ESO's Early History - The European Southern Observatory from concept to reality ' (1991). The designation OB refers to the classification of their spectra which mostly show absorption lines of hydrogen and helium. Their high surface temperature, in some cases up to 50,000 o C, and large masses, from 10 to 50 times that of the Sun, are deduced by analysis of their spectra. The term supersonic means that the velocity of the moving object is higher than that of the velocity of sound in the surrounding medium. While it is about 330 m/sec in the Earth's lower atmosphere, it is about 10 km/sec in the nearly empty interstellar space. Professor Edward van den Heuvel works at the University of Amsterdam and is a member of the ESO Council, the highest authority of this Organisation. The group members are Lex Kaper, Jacco van Loon, Thomas Augusteijn, Paul Goodfrooij, Ferdinando Patat, Albert Zijlstra (ESO) and Rens Waters (Astronomical Institute, Amsterdam, The Netherlands). In 1971, the current Director General of ESO, Professor Riccardo Giacconi , was one of the first to propose that `X-ray pulsars' are rapidly rotating neutron stars. This research project is described in ESO Preprint no.~1199 and will appear shortly as a Letter to the Editor in `Astrophysical Journal' (ApJ 475, L37-L40).